"Max Tolentino: Lines in Space"
From November 1 through 15, 2008 at the Independencia Shopping Galleria in Juis de Fora, Brazil, Max Tolentino exhibits his sculptures in a show entitled Lines in Space. Tolentino derives his inspiration from the Buddist princples - form is emptiness and the very emptiness is form; emptiness does not differ from form, form does not differ from emptiness; whatever is form, that is emptiness, whatever is emptiness, that is form. 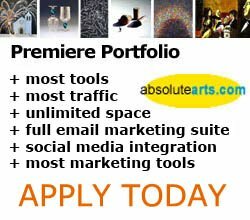 Max Tolentino has been a Premiere Portfolio Artist at absolutearts.com since 2007. What fascinates me is the exercise of art; it is doing something that can express my personal point of view of things and the perception and the expression of the world as I see. Anything that carries human significance may cause me an emotion with the same intensity that I see at any museum in the world. Art is an emotional and intellectual product to me. Since my late starting in arts I have been sculpting my way in the artistic scenario with a differenced curiosity so that my overture to this environment gives me a privileged position. Doubts - no doubt - will arise, as my works transit between the formalism and the concept, between the beautiful and the political in art. But the doubts belong more to the one who sees then to me. Maybe I want to go further than the cultural concepts � not that I pay much attention to it - but perhaps one day appreciating from outside I may glimpse a chance to be inside thus contributing in a certain way to this world.